The translucent blue 12 inch split of Carrie & Lowell Live is now in our store and your favorite local record store. The show is available on YouTube and Vimeo and as an audio download (and streaming) on most digital platforms on Vimeo here, or your favorite streaming/purchasing platform here. Sufjan Stevens – Carrie & Lowell Live from Asthmatic Kitty Records on Vimeo. The Greatest Gift, a collection of outtakes, remixes and demos from Carrie & Lowell, is available today on yellow cassette and all digital formats. Click here to pick your favorite listening venue. 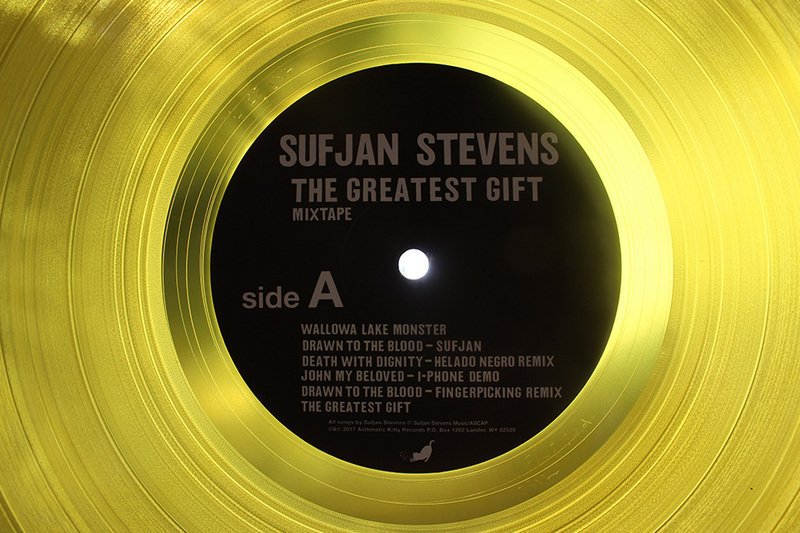 Greatest Gift arrives in record stores in vinyl translucent yellow vinyl on December 8th. 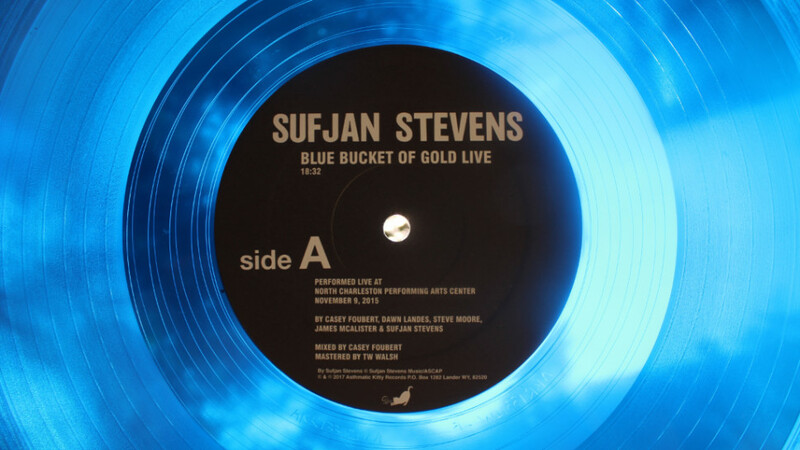 Also out today: Sufjan’s Blue Bucket of Gold / Hotline Bling (Featuring Gallant), available in stores on via AKR here. 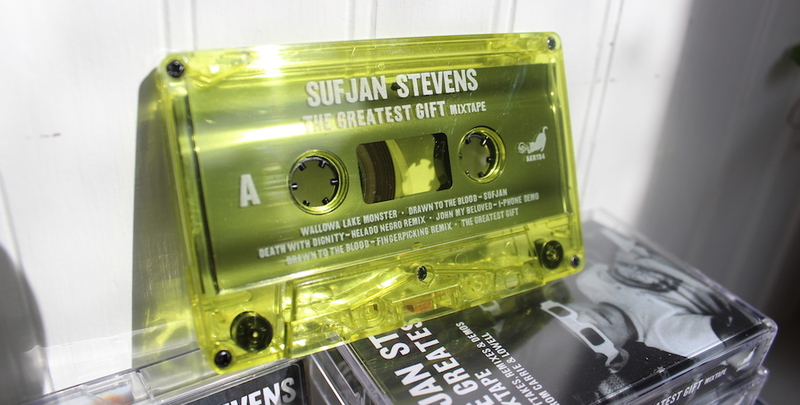 Sufjan has animated “The Greatest Gift,” the title track from his forthcoming mixtape. The Greatest Gift comes out Friday on digital and cassette, and December 8th on vinyl, but you can listen to the full album now, thanks to NPR’s First Listen series. Hear it here. Sufjan’s The Greatest Gift comes out Friday on digital and cassette, and December 8th on vinyl, but you can listen to the full album now, thanks to NPR’s First Listen series. Greatest Gift is out on digital platforms and cassette on Friday, November 24th, and available in translucent yellow vinyl on December 8th at your favorite local record store. P.S . The translucent blue 12 inch vinyl of “Blue Bucket of Gold” and “Hotline Bling (Featuring Gallant” is out in record stores this Friday November 24th. 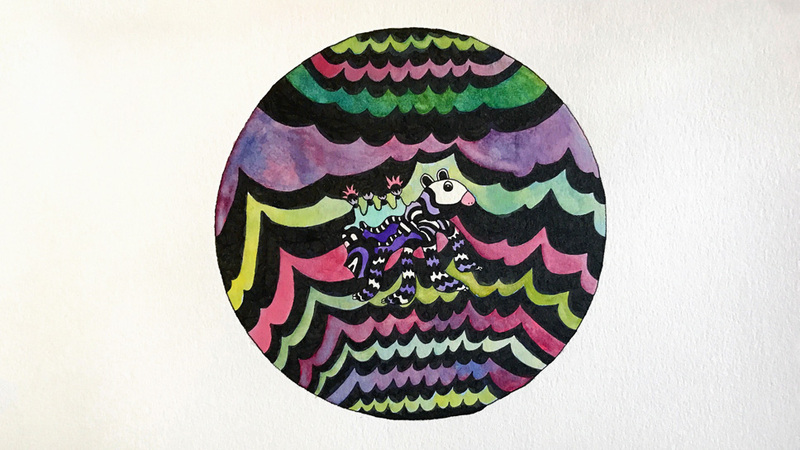 Sufjan Stevens’ “Wallowa Lake Monster,” from his forthcoming The Greatest Gift mixtape, premieres today. Listen above. The Greatest Gift, a collection of outtakes, remixes and demos from Carrie & Lowell, is set for release on yellow cassette and all digital formats on November 24, and vinyl translucent yellow vinyl on December 8th,. Check your local record store or favorite digital service for details. These include “Wallowa Lake Monster” as well as “The Hidden River of My Life,” “City of Roses” and “The Greatest Gift.” The new collection serves as a companion piece to the original album, alongside the Carrie & Lowell Live album released earlier this year. This new material, in its investigation of love, life, death, God, and the beautiful state of Oregon, serves as a contemplative companion to the original album. We hope you enjoy. We’ve been waiting since February to finally release Swim Inside the Moon from Angelo De Augustine, and we’re happy to say today is the day. It’s been on repeat here at AKR HQ since we first heard it, and we hope you’ll give it similar residence in your house, bike, car, office, home, street, park, sidewalk, etc. It’s available on Bandcamp, Spotify, Apple Music, and Amazon.The first run of vinyl is in bone color and available for purchase at our AKR Store, or your local record store as of September 8th. Angelo is on tour in Europe throughout the fall. Tourdates below. CLASH has debuted a lovely new music video of Angelo’s “Haze.” Watch the video above or over at CLASH here. Angelo illustrated the video and Matt Czap brought Angelo’s vision to animated life. ‘Swim Inside The Moon’ could be the first many fans have heard of you, do you feel it’s reflective of your wider work? How close to Angelo does this record go? We are constantly evolving beings, and as a result can never achieve an exact reflection of anything. Who is this Angelo? My intention is always to follow my instincts and listen to what the voice inside tells me, because it holds more truth than any external presence. Swim Inside the Moon is out in just a few weeks. 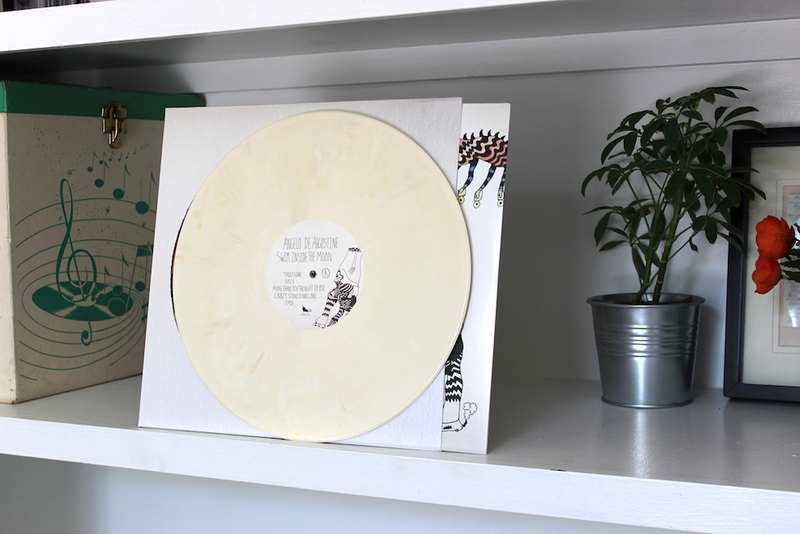 Preorder the first-run bone-color LP over at our store here. 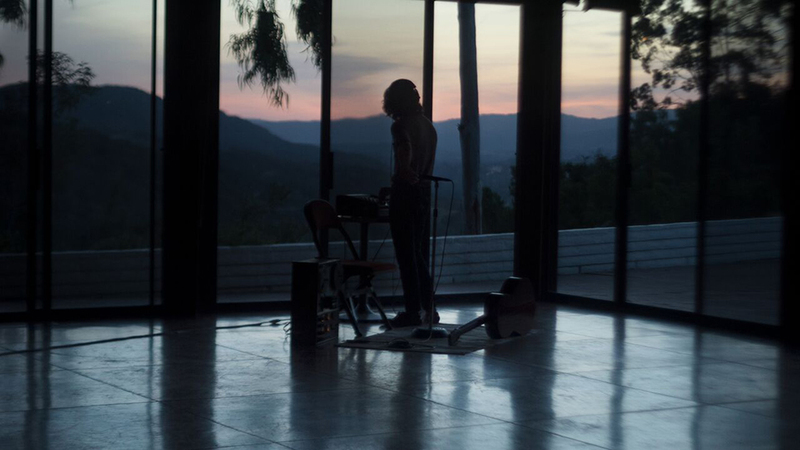 Jessica Nicole Collins filmed this beautiful single-camera shoot of Angelo De Augustine playing “Crazy, Stoned, and Gone” live at Meditation Mount in the hills ofOjai, California. Angelo’s new record, Swim Inside the Moon, comes out in late August, and you can preorder it here. 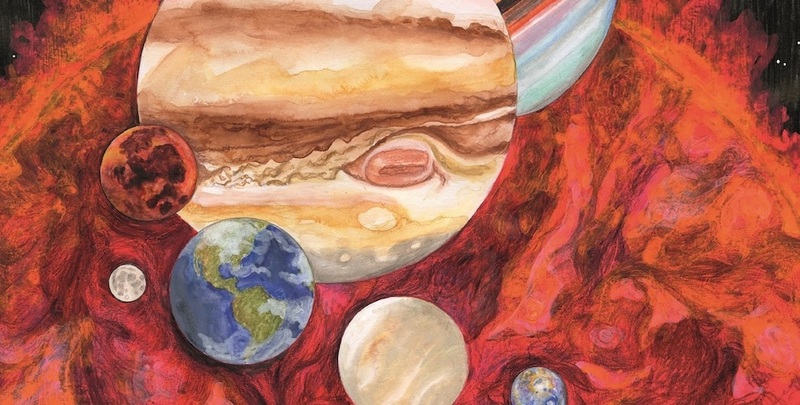 Planetarium, the concept album by Sufjan, Nico Muhly, Bryce Dessner, and James McAlister, is out now via our friends over at 4AD. Find it at your local record store, the 4AD store here, or your favorite digital purchase or streaming site. We also have some copies over at the AKR store here. Use the code “WEIGHTLESS” to get 20% off (good until June 17th). 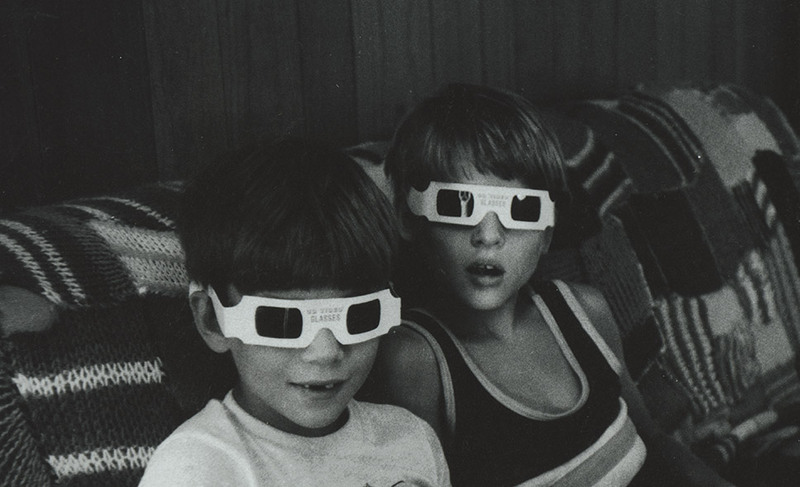 Sufjan, Nico, Bryce, and James are touring Planetarium. See below for dates.